For those who lost their jobs in IT due to technology service outsourcing, these jobs never disappear but just be changed hand to the consulting sectors. To gain the jobs back is to go after these giant consulting companies which provide IT outsourcing, enterprise integration, and technology services. IT consulting firms offer tremendous job opportunities, and it is relatively easy to break in. 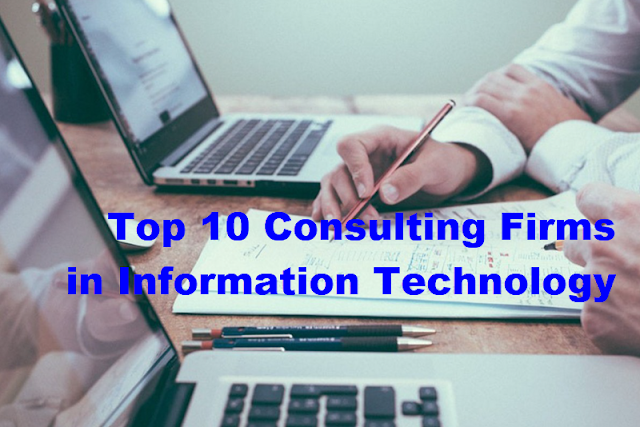 The following top 10 IT consulting firm list is provided for you to learn IT consulting services and relevant job opportunities. Accenture - Accenture is a global management consulting, technology services and outsourcing company, committed to delivering innovation. Accenture's IT service offers a full spectrum of technology consulting to harness the power of emerging technologies while getting the most out of the legacy IT. Accenture claims the expertise to combine business and industry insights with technology know-how. Accenture is known to hire a lot of entry level IT workers and seend them to the fields to gain hands-on experience. The salary is not great fo lower level consultants at Accenture but it is relatively easy to get in and start. Deloitte - Deloitte Consulting LLP provides Technology Integration practice to help IT organizations solve business challenges through the integration of technology - as discrete services and/or comprehensive solutions. Deloitte collaborated with The Rockefeller Foundation to develop handbooks for the long-term unemployed to re-gain and expand job opportunities. Deloitte website offers a downloadable PDF handbook for job seekers to navigate out of long-term unemployment. BearingPoint - BearingPoint is a global management and technology consulting company offering a range of solutions to address toughest enterprise challenges. BearingPoint hires a lot of IT consultants. When you join BearingPoint, you will focus on client engagement. BearingPoint says it offers you more than just a job; you are trained to be part of the firm's development and to become part of our team. CGI Group - CGI provides IT Outsourcing, systems integration and consulting services. Currently CGI has over 68,000 professionals in 40 countries across the Americas, Europe and Asia Pacific to provide end-to-end IT and business process services that facilitate the ongoing evolution of our clients' businesses. CGI is continually looking for professionals who have a passion for excellence, focus on client satisfaction, and are dynamic team players and solution finders. IBM Global Services - IBM is one of the world's largest information technology services and consulting provider. IBM engages its technology services experts/consultants to optimize clients' business: Cloud Services - Reinvent business with the power of cloud computing; Data Center Services - Build and manage highly efficient data centers that respond to change and drive innovation; IT Outsourcing - Partner to drive innovation, speed time to market, attract customers and foster innovation; Managed Services - Drive growth, eliminate downtime, scale operations, and improve application availability with the proactive management of IT resources; Mobility Services - Plan your approach, manage devices and end-user applications and related network infrastructure; Networking Services - Design, implement, and manage integrated communications and networking environments; Resiliency Services - Maintain business continuity and recover critical business applications no matter the circumstances; Security Services - Protect enterprise from complex IT security threats while reducing costs; Technical Support Services - Simplify management and streamline maintenance of multi-vendor environments. HP Technology Solutions - HP provides business solutions and IT services for data management, network security, CRM, call centers, software, and workplace productivity. HP acquired EDS to become one of the biggest consulting powerhouse. EDS ued to provide a broad portfolio of business and technology solutions to help its clients worldwide improve their business performance. Aiming to optimize enterprise business results with consulting, outsourcing and support services, HP claims its knowledge, expertise, innovation and world-class services to achieve better results for enterprise business. Its technological applications include the cloud, security, mobility, and big data analytics. Booz Allen Hamilton - Booz Allen Hamilton is a global Strategic management and technology consulting firm offering a full range of consulting services to senior management in industry and government. Booz Allen Hamilton states an open, explicit commitment to women's careers, saying that, as we focus on building a diverse workforce, we're committed to offering women the tools and opportunities they need to enhance their skills and build a career that forges a path for advancement as it accounts for the many demands in a well-rounded life. Booz Allen begins with an active recruiting program that reaches to colleges and universities, professional associations, the military, and technical and business communities to find and attract the most talented women candidates. If you are a woman and wants to enter the IT career, you may have the competitive advantage againt the opposite gender. Unisys - Unisys is a worldwide information technology consulting services and solutions company. Unisys provides a portfolio of IT services, software, and technology that solves problems for clients all over the world, with a unique focus on mission critical environments and a strong reputation for delivering reliable solutions. With Unisys on the leading edge in the hottest technology areas like cloud computing, data security, biometrics, and mobility solutions, a consultant may have great opportunities to build up top-notch IT skills. Unisys claims to ofter a workplace where individuals take personal responsibility for challenges but also share a highly collaborative culture. Capgemini - Capgemini is a leader in consulting, technology & outsourcing services. Currently Capgemini conducts consulting services in over 40 countries with almost 140,000 consultants, helping businesses and organizations to identify, build and carry through transformation programs that will improve growth and sharpen their competitive edge on a long-term basis. Capgemini's outsourcing Services manage, wholly or partially, over several years, IT systems for applications and infrastructures of a client (or a group of clients), and their associated business processes such as Business Process Outsourcing. Cognizant - Cognizant, a leading provider of information technology, consulting and business process outsourcing services, claims the ability to help clients meet both challenges, - to make their current operations as efficient and cost-effective as possible and to invest in innovation to unleash new potential across their organizations. Constantly hiring a lot of consultants worldwide, Cognizant promises that you can accomplish big things in your career at Cognizant, where there should be some exciting opportunities that match your interest. Give it a try.